Hypnosis for habit control: Ultra-powerful stop smoking, weight loss (or any habit) techniques. You reach a good level of trance, give wonderful suggestions, everything goes great as far as you can tell. The client calls you the next day and tells you they smoked as soon as they left your office. Why did they smoke? Why didn’t your suggestions work? Maybe you start to feel bad, lose your confidence, question the effectiveness of hypnosis. Maybe I’m just not good enough,” you say to yourself. Now there are lots of hypnosis instructors out there that are still teaching based on an old, authoritarian dogma. They’ll tell you that you didn’t have a deep enough trance. They’ll tell you that you needed to repeat your suggestions more or put more emotion into them. Their entire approach is about “forcing” the client to accept your suggestions. But you’re smarter than that. You know there’s got to be a better way. The problem with simple, direct suggestion for smoking cessation, weight loss or other habits is that you're setting your client up to battle with themselves internally.In a trance, we suggest that a client eat better or stop smoking. Well, the part of them that enjoys smoking or motivates them to eat they way they do now is listening and saying "That doesn't sound too good to me. I think I'll resist this suggestion. "So you've got part of the person behind you 100% and part of the person "resisting." What comes next - a battle! Let me ask you this. Let's suppose you were involved in a negotiation between two parties. Would the best approach be to label one of the parties as "bad," and start suggesting that it be gotten rid of? Well, that's what you're doing if you're using simple, direct suggestion to try to break a habit. While direct suggestion adds power to the side that wants to change the habit, there's still a battle a-brewin' in the back of the client's mind (where the real power is). Will you be successful? Maybe, maybe not. Will the client get easy, elegant change? Probably not. Truly, you'll rarely be effective with this kind of client unless you get all the client's motivations on the same page and working toward the same goal. I remember having a conversation with my bank manager (I'll call him Dan) several years ago. We were sitting at his neatly kept brown desk, in a busy bank lobby. He wanted to understand more about my hypnotherapy practice. Looking across the desk with a bit of a shaky voice (I think hypnosis scared him a little), he asked, "What is it you do exactly?" "Dan," I asked, "If you direct your arm to move with your mind will it move?" He looked and me strangely and said "Yes, of course." "How about your leg? Do you control that too?" I got the feeling Dan was a little sorry he'd asked me but he played along. "Sure." "Well," I asked, "Have you ever made up your mind to do something, maybe to start exercising or be more polite to people or eat better or stop smoking and then not followed through?" Of course, he had. Almost all of us have had the experience of deciding determinedly to start some new healthy, productive habit or stop some destructive one - and then dropping the ball. For Dan it was exercising. "Well," I said, "if your mind controls your arms, legs and the rest of your body and you made up your mind to exercise, why didn't you?" Poor Dan had no answer for that question. In fact, he'd never thought of it that way. How can people consciously make up their mind's to do something and then not carry it out? Don't we have control of ourselves? People have multiple motivations going on at the same time - some of them at cross purposes. I explained to Dan that human beings are not carved from a single block of stone. We may have more than one motivation present in us at a time. We may be conflicted. ?Yes, we want to exercise but we also want to relax and take it easy. Yes, we want to eat food that is good for us but we also may have incredible enjoyment out of eating that special something that's soooooo good (you know what it is). Yes we want to stop smoking but we get something out of it. I told Dan that I helped people to get those conflicting motivations all lined up so that they could live longer, better, more fulfilled lives. That’s what parts therapy is all about – getting all the motivations and resources of a client lined up and headed for the same goal. Remember a time in your life when things were going incredibly well; almost magically. Progress was effortless and you didn’t have to motivate yourself – you acted without even thinking about it. That’s the experience of being fully congruent – all your inner motivations lined up toward one goal. Now, you can get easy to follow, instructions to align the inner motivations of your clients. 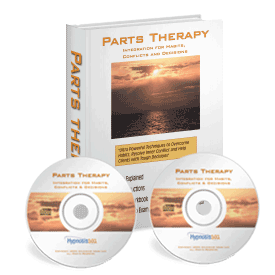 Discover the little known secrets of powerful parts therapy. Recently, I was involved in an open forum about smoking cessation with local hypnotherapists. Everyone was sharing their ideas about what their favorite and most effective techniques were. I’ll bet you can guess what answer came up like clockwork – that’s right, parts work! Almost without exception, the hypnotherapists I respect listed parts therapy as their main (or one of their main) tools in working with smokers. But you don’t even have to use a formal hypnotic induction to get dramatic results from these techniques! You can do parts work “conversationally” and have great results. In NLP, these techniques are known as the “visual squash” or conflict integration techniques. They are highly effective, and naturally “trancey.” In other words, people will often go into a deep trance when using these procedures but they won’t know it! Once I was using these techniques conversationally with a client. He suddenly dropped into a trance. Right in the middle of a sentence, his head plopped back on the back of his chair and he started snoring. One minute he was talking to me and the next he was out like a light. I continued to deliver suggestions to him and he continued to respond. We finished the integration work in trance and I emerged him from trance (by counting). He thought he’d simply fallen asleep until I pointed out that it was strange to fall asleep mid-sentence and that he came out of it only when I emerged him. And yet, there are instructors who teach that these techniques only work with a formal hypnotic induction! I’ll explain where they’ve missed the boat and how their error shows their lack of understanding about what hypnosis really is. This information alone (if you think about it a bit) opens up a whole new world of working with people conversationally. At any rate, I’ll show you how to use integration techniques inside of formal trance or out. This isn’t your typical “How to do Parts Therapy” program. This forty-nine minutes and twenty-eight seconds of highly targeted, valuable audio information on conflict integration comes from a live hypnosis training. 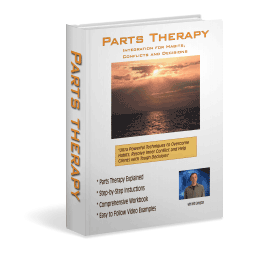 I put the concepts of parts therapy in plain words, and explain, step-by-step how to do it. Plus, you’ll get an extensive Q & A section from the students. They really run me through he ringer and ask just about every possible question you can think of. Remember, people paid hundreds of dollars just to be in the room for this training. 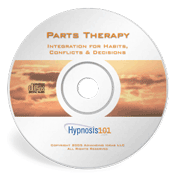 DVD Disk: Parts Therapy for Habits, Conflicts and Decision Have you ever read a book about some hypnosis technique and wished you were able to see it in action? Well, this DVD shows you exactly that. Not only will you get a chance to learn more about how to do parts therapy, you’ll get to see a conflict integration session right before your eyes. Explanations, Q & A sessions, easy to understand video examples and more to help you really learn how to use these valuable techniques. Workbook: Parts Therapy for Habits, Conflicts and Decision Theories, explanations, procedures–indispensable “how to” nuggets of information and no fluff. This disk includes exercises to increase your skill level, word for word dialog from actual sessions so you know how it works, explanations, bullet points and easy-to-follow, step-by-step procedures. Remember, people paid as much as $1427 to be at the live seminar. And you get audio, visual and written material not available to the live students. Keith, the parts therapy set saved my fanny Sunday with a smoking cessation client. We definitely had two very separate and opposing parts, separated for 38 years, chunked up and up and they finally agreed! It never would have worked with just regular hypnosis.Hi Keith, your Parts Integration saved my fanny AGAIN today. I had another smoking cessation client and we did the parts and in trance she put the parts back into her body and apparently it was a wondrous feeling for her. She still can’t get over it. I could NOT have done it without your product. And, yes, you can quote this one too! It’s absolutely the truth. Same content, instant access, lifetime access, no shipping cost, environmentally friendly. Shipped to your door. One DVD, one audio CD and a workbook. The guarantee is simple — 90 days on the last program you've bought from me. Plus, a 30-day price guarantee. Keith Livingston is one of the world’s top trainers in personal change & development technologies. Author of over a dozen NLP & hypnosis training programs, he’s trained hundreds of hypnotists, hypnotherapists & NLP Master Practitioners. Keith is a former President of the Washington State Chapter of the National Guild of Hypnotists, a Certified Hypnosis Instructor with the Professional Board of Hypnotherapy and is certified as an NLP trainer by the International NLP Federation. He also has certifications as a specialist in pain control, weight control, smoking cessation, and painless childbirth.